So far we've discussed the plugin API and we've shown a basic "Hello World" example of a module. In this chapter we take an enhanced version of the bar chart that we showed in Chapter 1 ("Standard D3") and illustrate how we can re-write this using the plugin API. At the end of this chapter we list how you can quickly amend this sample code to have three separate instances of the bar chart module all on the same page. We also provide a walkthrough of the "Bar Chart with Axes" example to illustrate how to create a bar chart plugin. One <svg> element per chart that contains the following code. One SVG <g> element that contains the chart. One SVG <g> element for each of the bars, the x-axis and the y-axis. <g> elements for each entry on the x and y axis. This structure is created below. Rather than manually recreate this structure for each instance of our chart, we can let our resuable pattern take care of that for us! Let's walkthrough the code to make this happen. 005:  // SVG 'g' element to contain the actual bar's of the bar chart. Soon we will outline the main differences between this example code, and that outlined in the "Hello World" example in the previous chapter. 001:// Setup our barchart in the d3.custom namespace. 002:    // Various internal, private variables of the module. 007:        ease = 'bounce'; // Use the 'bounce' transition type. 018:// Define the width of each bar. 001:// Append the main 'svg' element if it doesn't exist for this instance of the module. 002:// Apppend the main 'g' elements. 003:// The 'classed' attributes define the CSS class. Move the main <svg> element and x and y axis into place. 001:// Transform the main 'svg' and axes into place. Calculate a couple of variables used to layout the bars. Note that these variables will change every time the "exports" code is called (provided of course the data actually changes). 001:// Couple of variables used to layout the individual bars. Next up we move onto the enter, update & exit code of the module. 001:// Setup the enter, exit and update of the actual bars in the chart. 002:// Select the bars, and bind the data to the .bar elements. 001:// If updates required, update using a transition. 001:// If exiting, i.e. deleting, fade using a transition and remove. That's it for the definition of the module. Next, we look at actually creating an instance of a module. 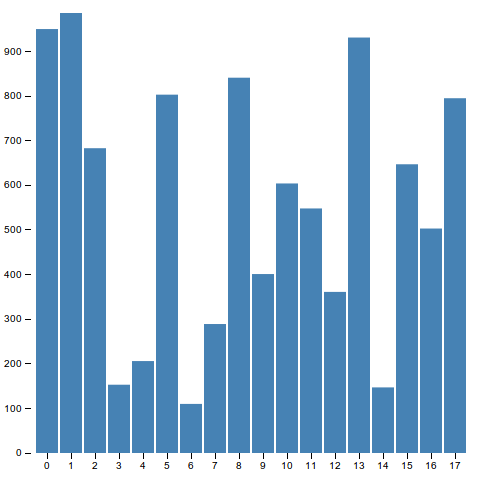 First, create an instance of a bar chart. Neither data nor selection has yet been passed to the chart, so nothing will actually happen based upon this function call. The update() function is called every second and creates a random data set, selects the <body> element in the HTML, passes the "data" variable containing the random data and finally makes the chart actually do something (by passing it the selection which the data has been bound to). 001:// Generate random sets of data. The double-tilde (~~) is a double NOT bitwise operator. It is used here as a generally faster substitute for Math.floor(). You can check jsperf.com for empirical benchmark test results, or create your own: this particular issue has been tested extensively. d3.range: Generates an array containing an arithmetic progression, so d3.range(~~(Math.random() * 50)) generates an array of numbers starting at zero, and ending at a random number between 0 and 50, e.g. [0,1,2,3,4,5, ...., 35]. It's basically a quick way of generating an array of between 0 and 50 numbers. The above fills each entry in the array with a random value between 0 and 1000. 001:// Call the update function to actually provide data to the charts and render the data. 004:// Call the update function once per second. The above is a walk-through of a barchart module/plugin, which is very handy when you need to create an instance of a barchart. We can quickly illustrate just how re-usable this code actually is. You now have two independent instances of the bar-chart, each with their own data, all on the same page, with no spaghetti code. A further enhanced version of the reusable chart plugin discussed above is available in code/Chapter04/ResuableBarChartWithTransitions: this one includes animation support for all parameters. The former way is a smart way to solve the problem where we know animatable reusable charts will be called many times in the web page's lifetime without the need to store the original "svg" d3.selection in the closure. The remainder of the code in the 03.reusable-chart-with-transition-support.html is a simple expansion on the bar chart plugin code shown in this chapter, only extended with animation (d3.transition) support. This chapter more fully fleshes out how to use the reusable API to construct reusable charts. In the next chapter we move onto discussing how to use test suites to fully test the plugins, modules, and components that we create.